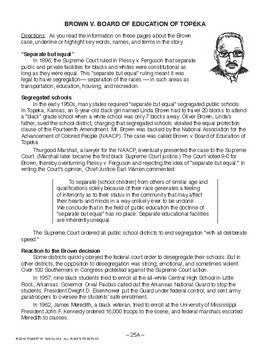 Brown v. Board of Education, AMERICAN GOVERNMENT LESSON 25 of 105, JEOPARDY! 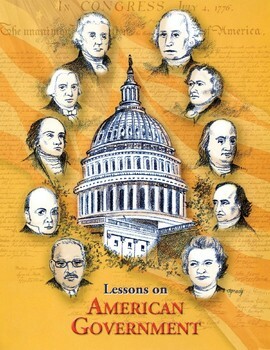 To become familiar with the Brown case and the effect the decision had on American society. A large drawing of the gameboard is put on the board with five categories: SUPREME COURT, PLACES, WORDS AND TERMS, PEOPLE, and MISCELLANEOUS. If a whiteboard is available, you can simply project the game board on page 25B. The class is divided into two teams. Someone from Team 1 is asked to pick a category and point value. For example, they might choose “SUPREME COURT for 20.” A question will then be asked about the Supreme Court of the United States. The first person on either team to raise their hand is called on. A correct answer earns the team 20 points. If an incorrect answer is given, or the person called on does not respond immediately, the other team can answer. Complete game rules are provided on the lesson pages. When the game ends, you can give each student a copy of page 25C to do as a quiz or homework assignment.